HIGHLANDS, Barbuda, Feb 28 2014 (IPS) - Water rationing has become a way of life for the 1,800 residents of the tiny island of Barbuda, which has been experiencing prolonged dry periods, especially in the Highlands area near the main agricultural lands. Marine biologist John Mussington told IPS the problem is that the wet period has shifted from the traditional July to September period to September to November, and when the rains do come, the showers are sharp and end just as quickly. An artificial rainwater catchment is one adaptation option that can reduce the threat of drought. “Without areas to store the water when it comes, it runs off into the sea or penetrates underground,” Mussington told IPS. “The other problem is that the groundwater is ‘hard’ due to high levels of calcium and magnesium, and in many cases salty due to saltwater intrusion. 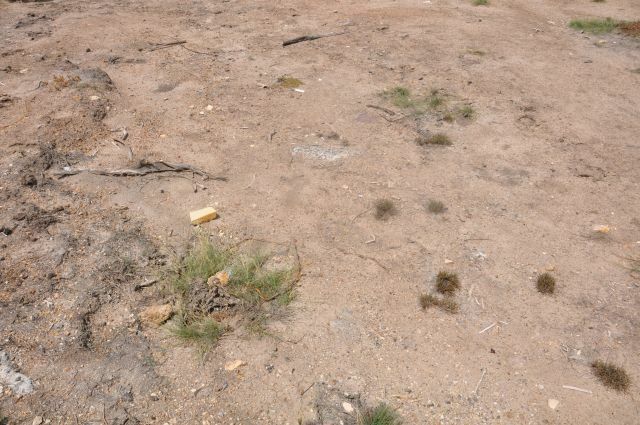 “This groundwater is not suitable for agriculture and because the wet season has shifted, the traditional method of planting crops at particular times so that they can be rain-fed is not as effective,” Mussington added. The director of the Antigua and Barbuda Meteorological Services, Keithley Meade, said that climate change poses the greatest threat to Barbuda and the rest of the Caribbean region. “If you look at what happened in the southern islands in December…climate change is impacting us,” Meade told IPS. A slow-moving, low-level trough on Dec. 24 dumped hundreds of millimetres of rain on St. Vincent and the Grenadines, St. Lucia and Dominica, killing at least 13 people. “We find that our droughts are drier than normal and our wet seasons are wetter than normal,” Meade said. As the conditions worsen, the state-owned Antigua Public Utilities Authority (APUA) has been urging residents to practice water conservation, with several public service announcements (PSAs) airing on radio and television. “No rainfall is expected within this period. We have been getting some drizzle, but not the gut showers that are needed,” water manager Ivan Rodriques told IPS. On average, Antigua and Barbuda requires 5.6 million gallons of water per day, increasing to six million gallons during the peak tourism season. But there is a flicker of hope: the island is set to benefit from an artificial catchment area to trap rainwater. The much needed help is thanks to the Reducing the Risks to Human and Natural Assets Resulting from Climate Change (RRACC) project, being implemented by the Organisation of Eastern Caribbean States (OECS) in partnership with the United States Agency for International Development (USAID). Mussington welcomes the plan to build a water catchment and storage area on the western edge of the Highlands to overcome some of the challenges being faced by the island. “Incidentally, the concept and initial project design was my doing. By harvesting rainwater on the Highlands and storing the water, it can be used throughout the year to produce high value vegetable crops. “By incorporating an aquaponics component, Barbuda could become self-sufficient in vegetables and also have the availability of fresh fish for local consumption and export in a more efficient production system,” he said. Gaston Browne, who is seeking to oust Prime Minister Baldwin Spencer in general elections, constitutionally due here in March, has vowed to make Barbuda “the breadbasket” of the twin-island state. But with forecasts for hotter and drier conditions going forward, Browne could find it difficult, if not impossible to realise his promise for the drought-stricken island. 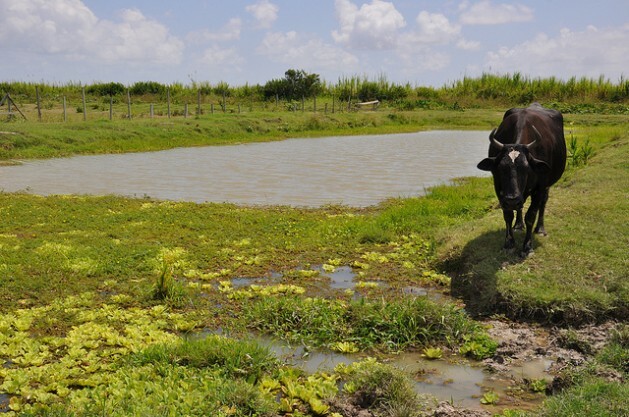 Barbuda and mainland Antigua are not the only countries where drought, brought on by climate change, is wreaking havoc on agriculture and water resources. National Oceanic and Atmospheric Administration (NOAA) scientists said last month was the warmest January since 2007 and the fourth warmest on record. It also marked the driest month for the contiguous United States since 2003 and the fifth driest since records started being kept in 1880. Ironically, predictions are that the tiny 62-square-mile island of Barbuda could sink in 60 years due to sea level rise. “The challenges that small island developing states are facing are challenges that all countries should be concerned about,” the head of the U.N. Department of Economic and Social Affairs, Wu Hongbo, said at the launch. He noted that small islands are particularly vulnerable because of their unique locations. For example, the hurricane season has devastating impacts on lives and property, particularly in countries which see an increasing number of cycles and decreasing rainfall. “Climate change represents a grave threat to the survival and viability of a number of low-lying nations,” U.N. Secretary General Ban Ki-Moon said in his address at the launch of the International Year. To galvanise support for addressing climate change by reducing greenhouse gas emissions and mobilising political will, Ban will convene a Climate Summit on Sep. 23 in New York. U.N. member states agreed two years ago to support 51 highly vulnerable Small Island Developing States (SIDS) – a group that was politically recognised at the Rio Summit in 1992, underscored at a major international conference in Barbados in 1994 and again at a follow-up meeting in Mauritius in 2005.